Home….home…..Oh I love to come home after any trip. Market closed at 4 pm and and pulled out of the convention center at 6:15. Not too bad considering the lag time it took to get the car pulled around and loaded. We drove for 3 hours and then stopped for the night. Got up and were home in Atlanta by 3 in the afternoon.Quilt boy was introduced to books a la ipod on this trip. He loved it! I listen to books on my ipod all the time so now he understands why I enjoy them so much. I really makes the trip fly by. Oh it is good to be home. Osama Bin Doggie (aka Sophie) was glad to see us. Mary Beth is home for the summer and working at the hospital. Today was her second day working in intensive care and a patient coded and died. She said it was very h ard to see for the first time. I BET. I swear I never take a good picture. I really MUST photoshop myself away! 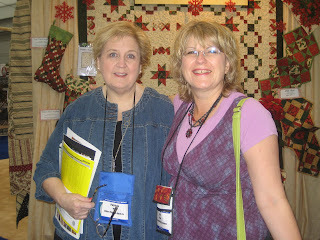 I promise I will post pictures of quilt booths and quilts tomorrow. Absolutely no photos of yours truly. 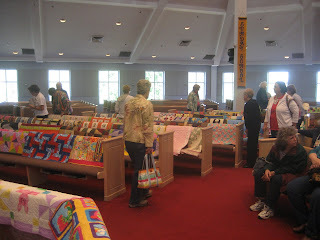 We had our annual Just for You quilt show today at guild. I love this day, seeing 350 plus quilts our members make for Scottish Rite Children’s Hospital is amazing. The pastor of the church had all the members get up and go put our hands on the quilts as he gave a beautiful blessing….the whole morning was simply lovely. So I went to lunch with Melissa we both said we had not yet unpacked from market so we ate quick and I came home to get tons of stuff done………Then our story takes another twist. Debbie called and was finished at the guild meeting (she is the chairperson for the Just for You project). She said what cha doin? I told her to get over here…she came over and we celebrated HER success of the day, and her 30th wedding anniversary (husband is in Germany ) and my return home from a successful market. We just celebrated by having a lovely visit together. Here is the confession part. At 1 o’clock we decided to have our celebration with a glass of wine…… (Emily called and was somewhat shocked her mother was drinking a glass of wine at 2 o’clock in the afternoon, this is not the conservative mother she knows and loves). Deb left at 4 ish… The funny part is that NEITHER ONE of us do anything like this EVER….The other part is….WE ARE NOT SO SORRY. I think we both needed sometime together and a bit of down time, decompression you might say. We decided it was so much fun that tomorrow we are going to see BAD MELISSA it seems we need a quilt shop fix. 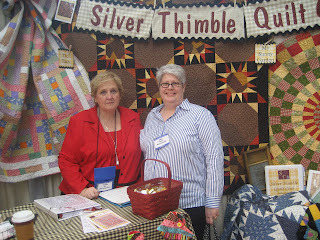 GO FIGURE as I just returned from the MECCA FOR ALL OF QUILTDOM... I need some neutrals for a project….and Deb needs a yo yo maker. There will be no wine involved in this excursion. I promise. Now that market has ended I have new projects to embark on. Quilting and otherwise. I’m going to start a new book which is the latest in the selection process of my book club. The name of the book is ” People of the Book” by Geraldine Brooks. I can’t wait to start this book. I think it will be good to read and perhaps I will get to enjoy something outside of the quilting world ..well maybe!